Comet C/2014 Q2 (Lovejoy) on January 16, 2015 at its best. 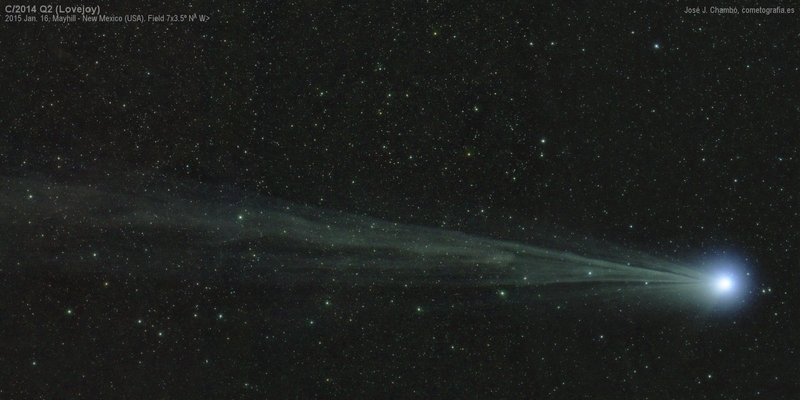 In this image, composed by a mosaic of three frames and covering a field of 7 x 3.5 degrees, the comet shows a powerful coma of 40' wide shinning at 4th magnitude. A long gassy tail is thrown toward East in which can be see several jets opening in angle. Manifold details are perceived in these streamers, ripples, knots and a disconnection at 2 degrees from nucleus.